The State of the American Traveler, a major bi-annual study conducted by leading travel research company Destination Analysts and sponsored by Miles, looks at American leisure travelers and their intentions, behavior and media usage. In the summer 2012 edition, we once again probe the use of Destination Marketing Organizations by US travelers - online, in print and at visitor centers. We also looked at travel intentions and behavior in destination selection, trip planning and media use. 1. Importance of Destination Marketing Organizations - 40% of American leisure travelers used a DMO web site, print visitor guide or visitor center. These travelers are affluent, optimistic, savvy but value conscious. The State of the American Traveler looks at travelers' profile and travel planning behavior in depth. 2. Uneven Travel Recovery - The slow and uncertain recovery of America’s tourism economy continues with a slight softening in travel intentions, as compared to the winter 2012 State of the American Traveler. Affluent domestic consumer segments and many international markets (i.e. : Canada, Australia, Brazil and China) remain bright spots. 3. Masses of Media - American leisure travelers are using an increasing range of media - both online and offline in their decision making. The average leisure travel decision maker spends over seven hours researching their trip across media. They use complex media channels and demand deep, rich, relevant information and content. 4. Mobile In the Mainstream - Mobile use by travelers continues to climb. 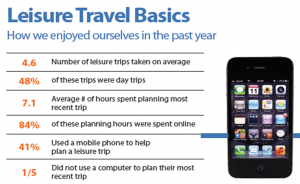 Now 41% of all American leisure travelers use a mobile device in trip planning, both before and during travel. 5. 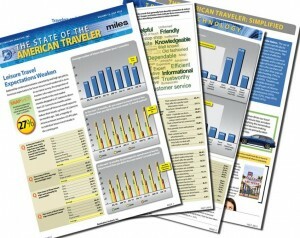 Print usage Strong - While 4 out of 5 travelers go online in their trip planning, print usage by American leisure travelers reached 49% in June 2012 and continues to hold strong as part of a complex media landscape.